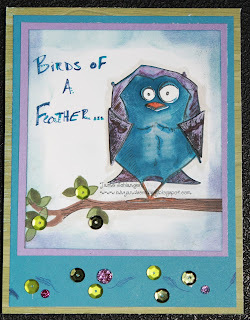 I finally got to play with my new Tim Holtz Crazy Birds Set. Both Stamps and Dies. Oh I have wanted these forever! The top pic shows the layering better. The bird is actually die-cut and pasted on top of the stamped branch (CTMH you and me set). Then the eyes and beak are die-cuts and mounted with 1/4" pop tape. The side wings are as well. I added sequences from stash and purple glitter gems from CTMH. I hand drew the purple feathers. to the border. And I played with my pens for the sentiment. The papers are all CTMH as well as the inks. In colors Gypsy and Pacifica.